I am sure some readers (mentioning no names) can add to the list…. This entry was posted in Uncategorized and tagged age. Bookmark the permalink. 37 Responses to You know you are old when…. I’m trying to figure out if I don’t know what these things are because I’m not from your country, or because of our age difference. Either way, it’s an interesting post. 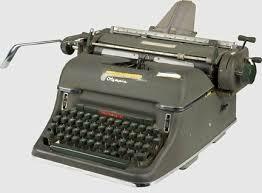 P. S. Hoffman: I think typewriters were pretty universal! When I lived in London there was a theater or cinema nearby that showed only children’s animated films. It had many features old and new each week and given my age was one of my favorite places. It seems impossible such a thing could exist today. Organ grinder’s monkeys were common and used to climb to the window of our flat to collect tips for their owners. Like Hoffman I am unsure of the situation in Britain today and over time but I imagine that also is much diminished. Lastly. If Londoners still feed pigeons as we did they are the last of the big cities where I fed pigeons as a child to retain the custom. It would be a very different city if those things alone had changed for someone of my age and inclinations. . .
franksummers3ba: Fascinating. It also brings back memories. I should have added usherettes in a cinema coming out in the intervals with ice cream and other refreshments. My family went to the ‘pictures’ and stood while the national anthem was played at the end of the program. when football games were all played on saturday at 3 ! Not forgetting the smaller SILVER three-penny piece. Put into Christmas Puddings for luck. Printed brown, they were needed then, you couldn’t carry 10/- (ten shillings for your younger readers) in copper, half-crowns also know as half-a-dollar. Stuck onto you National Insurance card. Going into every pay payphone and pressing button B to get somebody elses forgotten money back., what it was to be 10, first STD calls coming rather than call the operator. They saluted cars with AA badges, if they didn’t it was a warning of a speed trap ahead. Sounds POSH, pen you dipped into an ink well and paper for some of us. No ball pens. One channel five to six hours a day. I can just remember the childrens program ‘Billy Bean built a machine’. a bit young for me, I was eight at the time. Buying a bar of chocolate with strawberry filling the day sweet rationing ended, cheese rationing ending, ration books ending. Buses with conductors who took your money and gave you a ticket, rolled bus ticket machines coming in, steam trains in Brunswick Green (ex LMS Region). Ah yes, I was there. D F Rostron: Ah yes, steam trains. And attendants at petrol filling stations. I should have included no motorways (freeways for your overseas readers), a trip to London some 200 miles away was epic close on 8 hours, the arrival of ‘unbreakable records’ 7″ 45 rpm, 12″ LPs 33 rpm, The Eagle comic with Dan Dare with a bit on feminine equality with Professor Peabody in the story line with the Mekon as the enemy, the end of the Government Standard Packaged (and taste) Margarine with ‘branded margarine’ arriving. Cars becoming available in colours other than black, heaters in cars an optional extra fitted by the dealer……………..I suddenly feel old. D F Rostron: Oh, yes ‘The Eagle’: I have fond memories of it. I recall that research showed that those who read the comic tended to do well academically. I presume that was compared with those who read comics like ‘The Beano’. You had to have read ‘The Eagle’ to understand references to Angus Maude looking like the Mekon. I remember a worrying number of these things – though in some cases because of re-launches (e.g. my brother read the Eagle) but that can’t explain many others! I don’t remember much of that list. Of things past…travelling out of London on the trains with separate carriage compartments which shut out the noise of all the few people with you (or alone if you were lucky!). I especially the miss the domino like slams of the old doors on departing trains and a whistle blown…. I remember mobile phones being as big as a car battery and when video tapes to play in the VCR were considered scientific. But, most of all I remember how Freedom felt. Freedom to swear when it felt good. Freedom to dislike intensely without some lunatic claiming it was a crime. Being able to play in the woods without my parents forcing me to have a mobile phone for my protection, or worse, not allowing me to explore at all. But most important of all, I’m old enough to remember when men gathered with my Grandpa in his study to drink whisky and smoke big glorious smelling Cuban cigars, gleaned from some underhand source. And that my Nana didn’t mind making them coffee when they wanted it, in order to keep them happy. She never felt put upon or put down by her role as domestic goddess and this made me feel very safe and satisfied. I fit so securely in the natuaral order of things, looking forward to maturity of the female within. Something the children in my family no longer have any idea of or what the sense of being left to enjoy oneself without the burden of neurosis feels like. They will never know the privilege of sneaking into a smoke filled room that smelled of old whisky mixed with cigar smoke and sit on the lap of a man who was free to be himself and tell me what a joy I was to behold. PS: This return to the childhood thread and posts reminded me of another memory I cherish. The huge black records my Grandpa had and used to play on some electrical device that dropped them down onto a turn table and an arm with a needle on a hand at the end of it would drop with a thump onto the groove that somehow gave it sound. It went like this. It takes awhile but Edmundo does get off in a minute or two. I saw a movie recently that brought it back with a start, as the main player had an uncle that liked this guy as well. You know, LN, your blog can be amusing at times. Unlike LOTB. That site remains as stiff as a poker no matter what is going on in the world. Vinyl may be having something of a resurgence – http://www.telegraph.co.uk/culture/music/music-news/10556186/Vinyl-sales-highest-for-15-years.html. How long before CDs are a thing of the past? Maude, I agree that freedom has been curtailed in some areas, but look at the positive changes in this area – especially in gay rights, culminating in gay marriage. As an advocate of civil rights I’m sure you’re as delighted about this as I am. And of course we have our own Lord Norton partly to thank for this. Do remember the Tories are trying to put their best foot forward to promote a win for the next general election and that little sideline will do nothing for their image at all. That is a socialist or marxist PC policy is it not? Leave that little fiesta as a side issue along with the fake Scottish vote. Maybe the chap on the right in this little clip will give you a lift this morning, Dean B. Have a happy day! Maude. I think your posts serve as a valuable lesson for anybody considering posting comments to a well respected blog at 4am. To accuse Lord Norton of being part of getting a “socialist or marxist PC policy” through the House of Lords doesn’t reflect well on your judgement. It is clear that your view of “freedom” is not a general appreciation for civil liberties, but applies only to you personally, and your wish to do as you wish. The golden age of freedom you allude to was anything but for the gay community, who could not even admit to being gay, let alone have any quality of life anywhere near that which you seem to believe you deserve. The same can be said of ethnic minorities of course. And indeed many women, the very group you profess to be standing up for, will feel that your opinion that they were more free then than they are in 2014 is perverse to say that least. As for the video clip, I can barely believe that you are suggesting what I think you are suggesting. I will hold off making any comment on it, and give you a chance, if you wish, to explain your thoughts in posting it, and what I am supposed to take from it. Well now, determined to turn this light and enjoyable thread into a gay rights moment aren’t you?. Whilst alluding to LN being complicit in your logic for doing so. He can always remove my posts if he feels they insult his political views or working practice. Now why would you do that? Could it be it is you who are perverse here? How could you turn a simple memory into such an appalling attack? Your only claim to fame appears to centre around being put upon, either through the women you wish to pretend you are speaking for, or, ethinics. Whom, incidentally, are far from being a minority in London and or many other parts of the UK. Then, perhaps you are simply hoping to use this spin to promote more viewing here? Though more likely it is to prove what a good ‘spinner’ you yourself are in order to either, keep your job or apply for for a new better paying one. Either way, it is obviously self promotion you seek. Typical of self interest and deadly to a community. Whatever it is you are begging for, leave me out of your nasty little play and take a dig at those whom you feel have put you in the misery you obviously are. Which is the genuine reason you have taken my post of domestic content or bliss, along with clips of the happiness shown in them by my family favourites, in order to ridicule. Can’t have anything like Freedom being raised as an awareness message can we? Or, that a household of male/female contentment could be envisaged as unthreatening. Thank you for taking the trouble to reply, although your logic is no better in the middle of the day than when you are burning the midnight oil. The claim of self promotion goes no further than the realisation that I have not used my full name, nor linked to any website despite this blog giving me the opportunity to do so. 1/10 for insight there I’m afraid. As to the rest of your claims, you characteristically ignore the substance and present red herrings and straw men. I have in no way sought to ridicule your childhood memories. They sound idyllic, and I have even already agreed that in many ways people had more freedom then than now. I simply pointed out that many did not have the freedoms you had, and listed some examples. Rather than dispute that you have appointed me some kind of wannabe spokesman for those groups. Not at all – the changes have already happened, they do not need a spokesman, I am simply asking you to acknowledge that progress has been made in these areas of civil liberties. I am at a loss as to understand why you wouldn’t agree with that, still less why you consider my asking you about it an “appalling attack”. It was you that brought up the issue of freedom, and freedom is a political issue, always has been, always will be. Finally the video I am referring to is where you refer to the chap on the right making me smile. Many people reading that will suspect that in posting this with the comment you did, that you are displaying a misplaced homophobia (misplaced since I am not gay) of the vilest kind. I am sure there is some other explanation, and would love to hear it. Why did you think that man would make me smile? You strike me as somewhat unstable. Here we see another Dean B who has a strange fixation toward female tweeters. Could it be you I wonder. It’s called the tar baby syndrome. Best to steer clear of vexatious creatures. No Maud, that is not me, although I am flattered that you have taken the time to try and fine out more about me. I note your continued insistence on trying to undermine me personally rather than address any substantive points, nor offer any explanation as to what continues to look like vile homophobia. I think people will draw their own conclusions. I note your continuous mysogynistic trait and am very sure ‘people’ will draw their own conclusions to that. However, unlike your lean toward vanity, I’m not at all flattered by you trying to find out more about me. I realised almost as soon as I hit “Submit comment” that the sarcasm would be slightly lost on you. Have a great day too. P.S. I won’t even ask what the rest of the gibberish I’d about. Right, back to things remembered of yesteryear…. Tape recorders, the ones with 6(? )-inch spools. Tiny bottles of rose-water fragrance, picked from the Christmas tree. Vesta Chicken Supreme & Rice. tizres: Good gracious, you mean you can’t get things likr Barley Sugar? The good news is that there is a Retro Sweet Shop in Newland Avenue in Hull. Three-penny bits, brass multisided ones or small silver ones. I remember Paul Sutton’s graphic description of john Maynard Keynes reaction to the withdrawal of the dollar loan agreement one consequence of which was the withdrawal of silver coinage. Half pennies, is this 1/2d or 1/2p? Ten shilling notes. What about one pound notes south of the border? The great advantage of predecimal coinage was its ability to be divided into equal amounts. A great uncle would send every Christmas a £1 note to my father which was eqally divided betwenn my older brother and sister ten bob each. When I came along he did not increase his gift, but much to my siblings’ chagrin it could be subdivided by three to 6/8d. Green shield stamps, I recall a near riot in Castle Street Hinckley when double stamps were offered. I was still filling books of stamps from the Yorkshire Co-op in the 1990’s. Pressing button A or B, when a local call was 2d (less than 1p). Are there any white phone boxes left in Hull? AA patrolmen on motorbikes, British motorbikes. And AA and RAC call boxes. Roneo machines. What about Gestetners, the desk top publishing of many a left wing radical group. Typewriters, I bought a Remington and “teach yourself typing” to do my third year dissertation. The Eagle, I always thought James Molyneaux was a beter lookie-likie. But it was also the original publication for Captain Pugwash. Other things that you can remember when you are old is the Conservatives having an aristocratic Scottish prime minister and more than a third of the Westminster seats in Scotland.